The bluebirds will be migrating south soon as they are insect eaters. But, oh, how nice it was while they were here to see that bright blue color flashing across a country field! They do like open country and are found on farms, and where there are scattered trees rather than woodlands. The Eastern Bluebird is found east of the Rockies while the Mountain Bluebird with its whitish belly is found to the west. 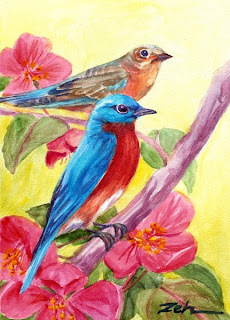 Here I have painted the male and female on a blossoming crabapple tree at about the time they would be nesting. Their young will be speckle-breasted with a hint of bright blue in the wings and tail. The original painting is sold, but contact me if you would like a print or a painting done just for you.